You might say that Audioengine have really caught our eye of late. And you wouldn?t be wrong. Our recent trial of their USB stick DAC D3 has got us all excited about the American manufacturer?s ultra-compact powered speakers. 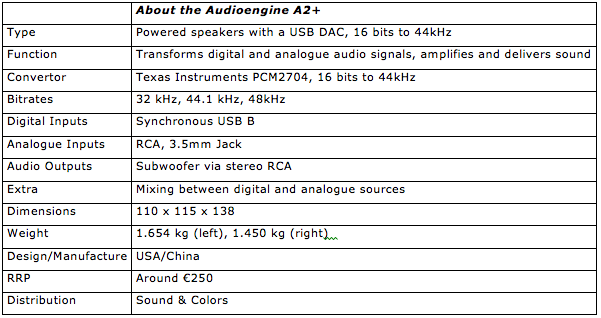 The largest Audioengine model, the A5+ speaker, doesn?t feature a USB input, but the smaller A2+ we?re looking at today does features a USB B input (limited to 16-bit at 48kHz files, and with no Studio Masters playback. 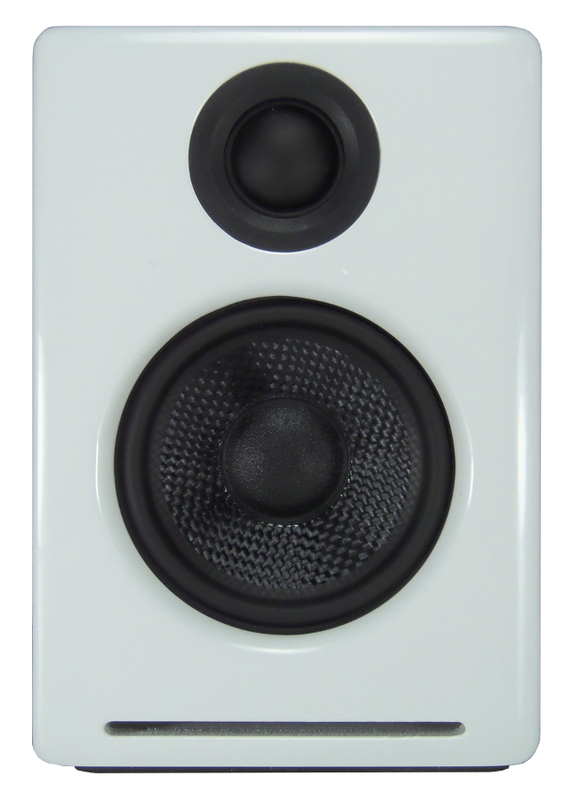 This small speaker was designed primarily as a quality audio system to be used with a computer, but the two analogue inputs and the output for a subwoofer, alongside the USB input, make it more versatile that that. The sound quality doesn?t disappoint either, as you?ll see in this test. The A2+ is more of a micro-speaker than a mini-speaker, and it couldn?t look simpler. It?s a classic box in 18mm MDF, covered in either a glossy white or a satin black finish. The underside features a layer of anti-slip foam as well as a 6mm metric threaded insert which allows you to fix it to a stand or bracket. 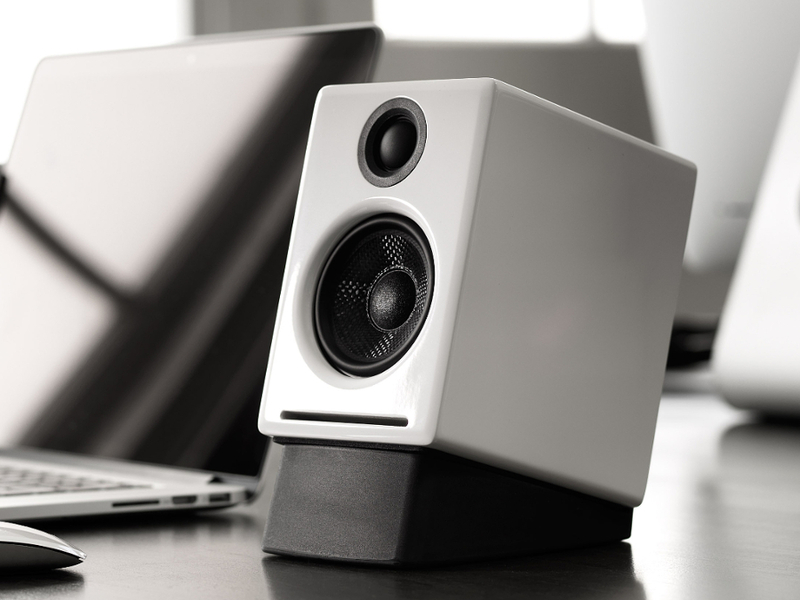 Audioengine sell a wedge-shaped desktop stand (the DS1) designed to tilt the speaker up towards the listener a few centimetres. There?s also a small slit on the front at the bottom, which acts a laminar flow vent. The shape reduces the noise from the air-flow and was also probably chosen due to the speaker?s small size. The subtle look is also welcome, especially as the speaker doesn?t have a grill. The electronics, including the stereo amplifier are in the left speaker, and the right speaker links up in the classic manner with a wired connection. A USB B input allows you to connect a computer, while the RCA and 3.5mm Jack can both connect to analogue sources. The volume can be controlled by a dial (with the on-off at the start) on the right speaker, or you can also make life easier by leave the volume dial at full and controlling the volume from the computer or analogue source (when possible). The external power supply connects via a three-pin mini-XLR. The speakers inside the A2+ mean serious business. The 7cm membrane on the mid-range driver is in Kevlar and the matching magnet is almost the same shape, which suggests good dynamic capacities. The tweeter has a 20mm diameter soft dome, which is as close as possible to the mid-range driver thanks to the use of a neodymium magnet, which is strong for its compact size. 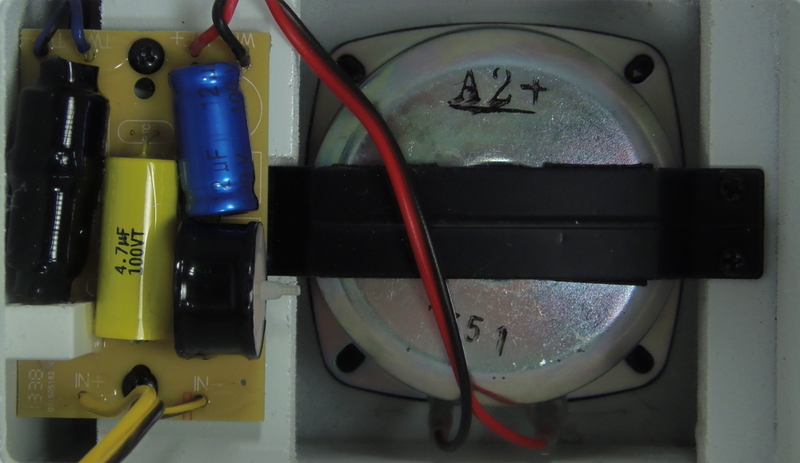 The filtering components are good quality, with a 4,7 ?F/100V polypropylene capacitor and a non-inductive resistor (the white rectangle to the left of the capacitor) which both suggest Audioengine have taken their over things. 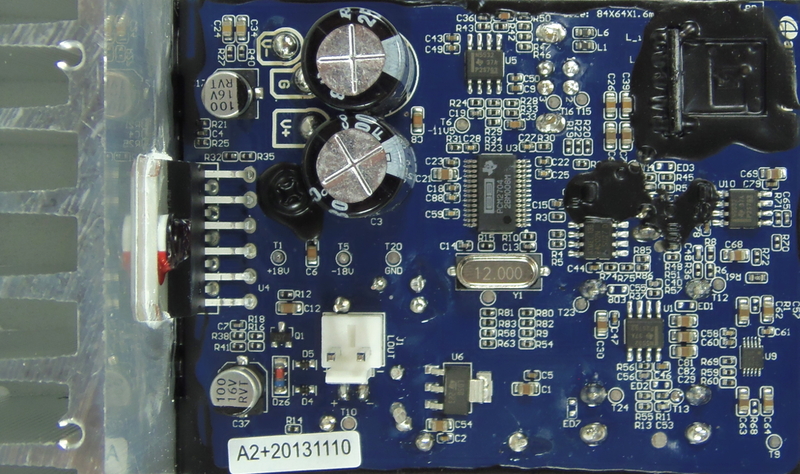 The A2+?s power supply comes via a separate power-pack connected to the mains by an AC power cord delivering + or - 17.5V under a 18A current. 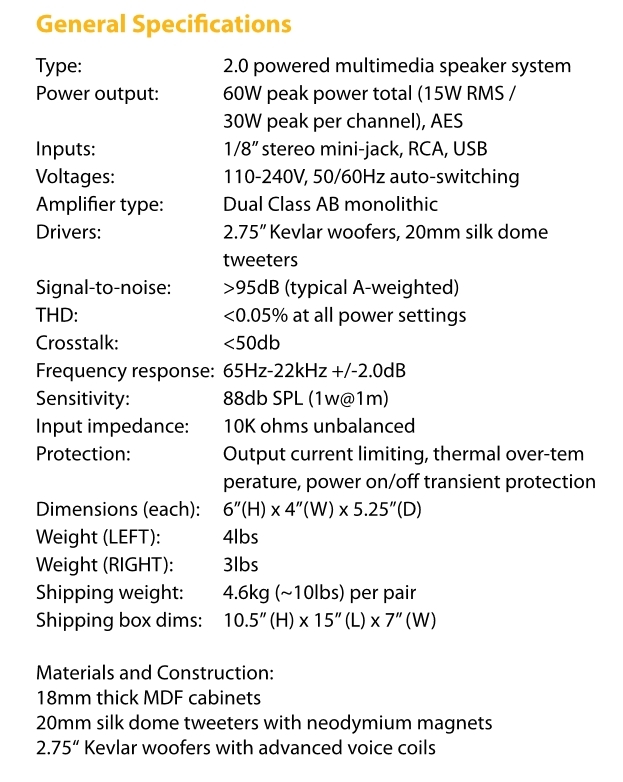 It connects to the speaker via a 3-pin mini-XLR and is filtered by 2200 ?F/25V capacitors once it arrives at the main board inside the speaker. The USB signals are taken care of by a Texas Instruments PCM2704 chip running synchronously with a sample rate up to 48kHz at 16-bit. This circuit also deals with the digital and analogue conversion. Signal filtering is then performed by an active filter built around a low noise Texas Instruments N5532 (NE5532) operational amplifier. The same operational amplifier is found in the pre-amplification stage as well as in the low pass filter after the analogue output which allows you to send the lowest signals to an active subwoofer. The instructions are rather vague regarding the use of the analogue inputs, just saying that ?two audio sources can be used at the same time? and (like us) recommending you control the volume at the source. This means these speakers can mix two sources, which we tested by DJing using the USB and RCA inputs. This potential for mixing explains the fact that we couldn?t find the source switch on the circuit as the signals can be added via a simple operational amplifier (it looks like the chip marked U1 takes care of this). The power amp is an integrated STMicroelectronics TDA7265 model, delivering just over 20W per channel (with less than 1% distortion). An aluminium radiator deals with the cooling, while the speakers are protected by an NJM2761 audio limiter made by the Japan Radio Company. We didn?t look that closely at the microcontroller, which is a simple Atmel 24C04 EEPROM chip containing code for the USB PCM2704 interface circuit. The electronics are clearly well designed and carefully put together, which we don?t often see at this price point. Blimey the little Audioengine A2+ speakers are powerful! We?ve heard finer and more detailed sound reproduction of course, but it it?s fantastic to see that you don?t even need to connect a subwoofer for really great sound, even if things get fairly over-saturated at higher volumes. The Upsetter from the Loveletters album by Metronomy (the 16-bit to 44.1kHz version) arrived all present and correct. We loved the consistent sound reproduction, the presence in the voices and the decent drive to the guitar. In fact, it was pretty stunning throughout. Testing the Audioengine A2+ with the Alpine Symphony by Richard Strauss (16-bit to 44.1kHz version), a massive work requiring nearly 150 musicians, was a bit tough of us, but the little speakers didn?t give up! Obviously you can?t expect flawless reproduction, but they were really quite impressive for their size. We?re a little bit addicted to Roar by Katy Perry. Okay, the bass doesn?t hit you like it would with a big driver but we cranked up the volume without a problem. And there was serious presence: caught up in the soundwaves, we were really carried away by the noises coming out of these tiny little speakers! Happy listening is also guaranteed with the Shakira album by Shakira (16-bit to 44.1kHz version) which drops you into the star?s rich and diverse musical universe. 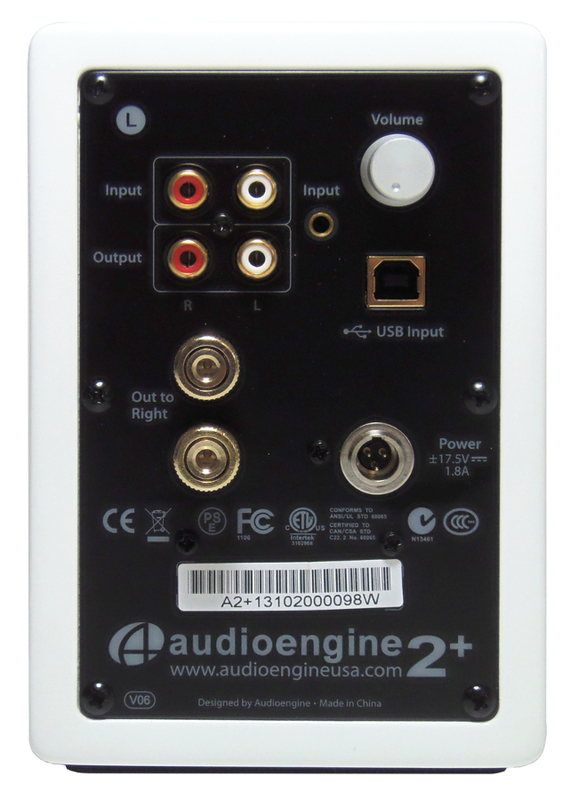 In conclusion: forget the fact that the Audioengine A2+ speakers won?t deal with more than 16 bits to 48kHz via USB and just remember the excellent value, and fantastic listening experience. It?s certainly enough to earn our approval. Pro-Ject MaiA Integrated Amplifier: all in the box!